Scarborough Castle dominates the Victorian Yorkshire seaside resort from a massive precipitous headland bulging up from the North Sea. The fortress has a fascinating three and a half thousand year, often bloody, story to tell, but one of its more dubious charms seems to be that the ghost of Piers Gaveston, Earl of Cornwall, and Edward II’s extremely close friend, is reputed to haunt it. Piers’ headless spectre, ‘tis said, leaps out of the shadows, causing the unwary tourist to tumble down the sheer cliff face onto the fish and chip wrappers below. It’s enough to give anyone the willies. Given the many souls that have lived and died at Scarborough Castle over the centuries, why Piers in particular should choose to linger like a bad joke at a dinner party isn’t clear, especially as he actually met his end 180 miles to the south, on Blacklow Hill, Warwickshire, where he was summarily beheaded and run through on the orders – or with the connivance – of the Earl of Warwick. Maybe his spirit prefers the salty sea air and the shrill wail of the gulls at Scarborough. There is evidence of human activity on the headland almost three millennia before Piers, however, from as early as 1600BC, maybe before, and actual settlement in two distinct periods, in around 800 and 500BC. Finds on the site include Bronze Age axes, tools, jewellery, pottery and a handsome sword, now in the British Museum though a replica is on display at the castle. It is likely that there was a hill fort there. Hundreds of years later, in the late 4th century AD, the Romans built a signal station on the cliff top – one in a coastal chain designed to warn of attacks from Germanic pirates. The signal station consisted of a fortified wooden tower about 80–90 feet (27–30 metres) high on stone foundations, surrounded by a wall, with an outer ditch. It seems to have been overrun and destroyed sometime in the early 5th century. Then, skipping another five or six hundred years or so (during which of course nothing happened unless you were there), a Viking called Thorgils Skarthi reputedly arrived (c965AD) and Scarthaborg was founded – Skarthi is an Old Norse nickname meaning ‘hare-lipped’ and borg (Old English burh) means ‘fortified place’ – so Scarborough means something like ‘Skarthi’s stronghold’. At around this time, or shortly after, a chapel was built close to the old Roman signal station – why and by who is not known. It is assumed, though there is as yet no firm evidence for it, that a settlement grew up in the vicinity of the chapel, and/or around the sheltered harbour below. In 1066, the Norwegian King, Harald Hardrada, is said to have set fire to the town of Scarborough and slaughtered many of the residents – shortly before receiving his come-uppance at the Battle of Stamford Bridge – and the chapel was certainly destroyed at around this time. Sometime in the 1130s, possibly during the Anarchy (1135-53) – a war over the English crown between King Stephen and his cousin the Empress Matilda – a serious fortress, probably in timber, was erected on the headland by William le Gros, Count of Aumâle (Albemarle, Normandy), who Stephen later created Earl of York. A decorated stone chapel, the Chapel of Our Lady, was built on the site of the chapel that had been destroyed in the previous century. 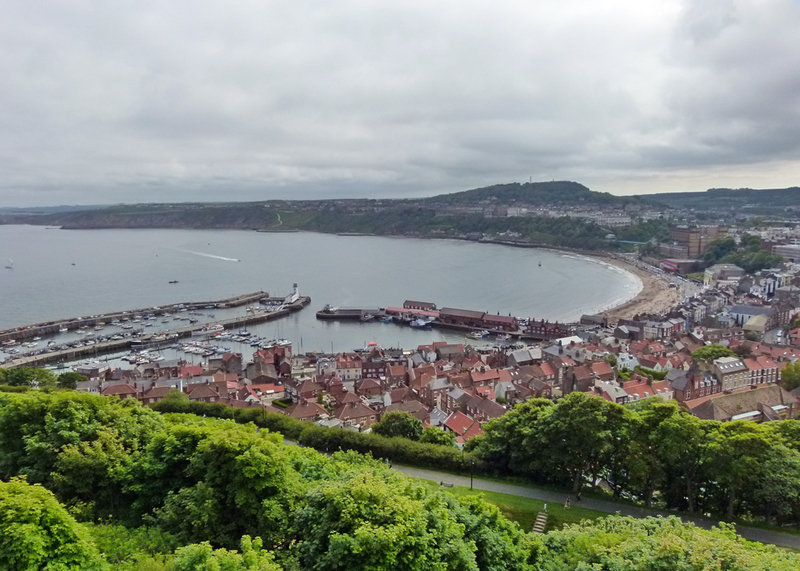 When Henry II became king in 1154, he made it clear that he wanted the land rid of unofficial, adulterine, castles – including Scarborough – which he seized and rebuilt in stone from 1159, at the same time establishing a town below its walls. 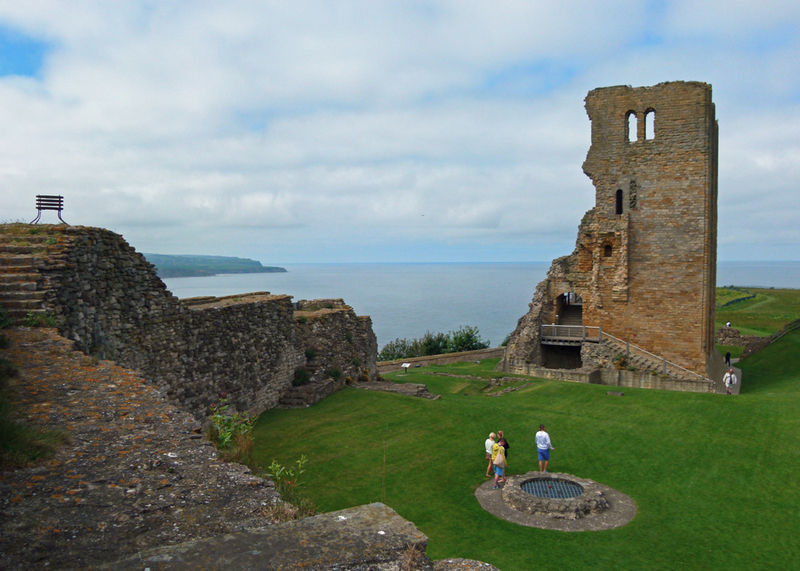 Scarborough Castle became a royal stronghold in the north of England – the keep dates from this period. Henry’s son King John carried out extensive alterations – including the construction of a royal chamber block and hall. 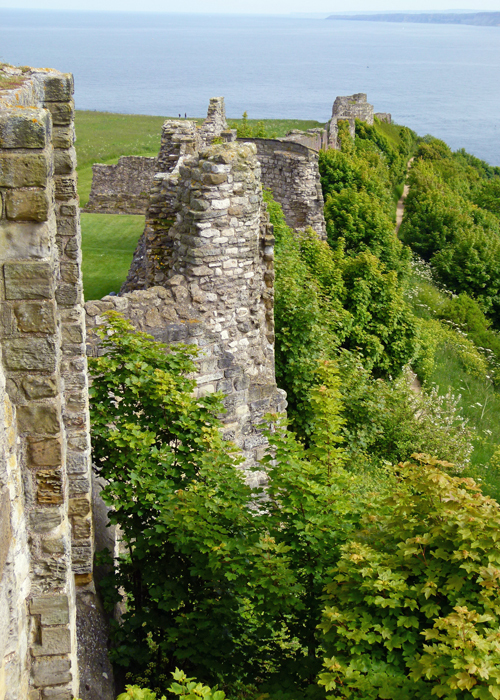 Indeed, John spent more on Scarborough than on any other castle – but perhaps he needed to, because repairs seem to have been a recurring need throughout its history. In fairness, it is an exposed site and, without ongoing attention, medieval castles tended to dilapidate. 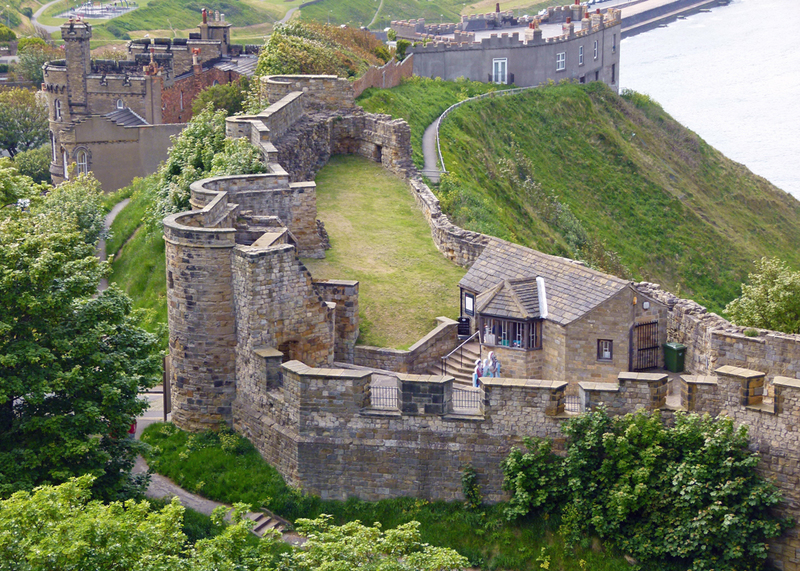 However, by the time of Edward I (1272-1307), who held court and Welsh prisoners there, Scarborough was one of the great castles of England, a key part of the country’s defences and guarding an important port. Piers Gaveston’s connection came in 1312, when he took refuge in Scarborough and was briefly besieged before giving himself up with the promise of safe conduct – a promise which, as we know, the Earl of Warwick did not feel bound to keep. The castle was attacked by the French during the Hundred Years’ War but, curiously, the Wars of the Roses seem to have passed it by. By the late 15th century it was in poor shape again, though Richard III stayed awhile in 1484, before going on to lose his crown to Henry VII and take up extended residency under a car park in Leicester. 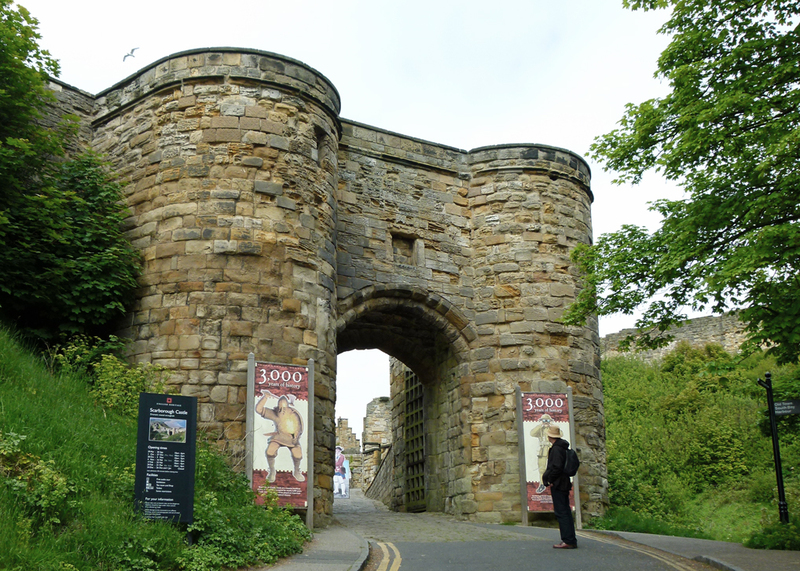 Scarborough Castle was briefly besieged by rebels in the aftermath of the Pilgrimage of Grace – a mainly Yorkshire Catholic revolt against Henry VIII’s church reforms – and one of the leaders, John Wyvill, was hanged in chains outside the town. It was under siege again in 1557 when Thomas Stafford, apparently something of a nutcase, walked in, proclaimed himself ‘Protector of the Realm’ and tried to incite rebellion against the Catholic Queen Mary, claiming that England would be overrun by Spaniards as a consequence of Mary’s marriage to King Philip of Spain. His concerns may have been understandable, but the castle was easily re-taken and poor Stafford was hanged, drawn and quartered at Tyburn. Thirty two of his followers were executed too – at least some of them at Scarborough, where their bodies were boiled and tanned as a deterrent for others; it would work for me. Things seemed to calm down a bit until the English Civil War broke out in 1642. 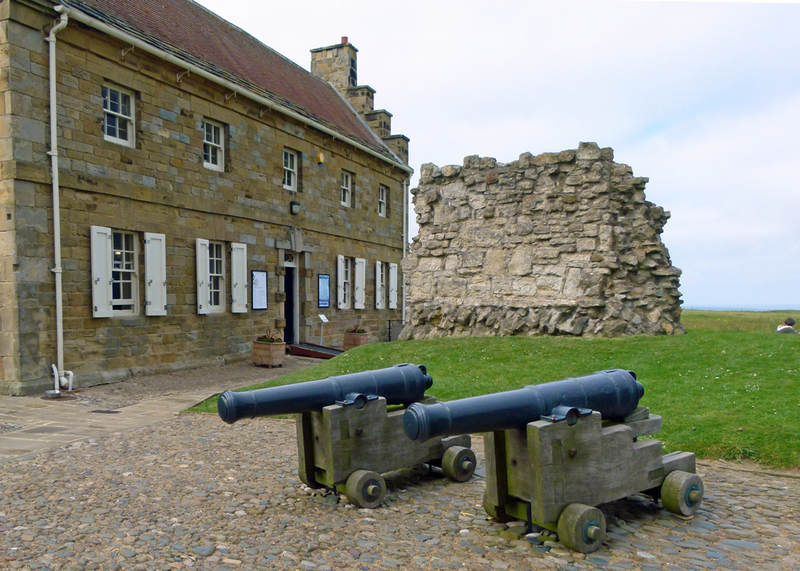 Local MP Sir Hugh Cholmley initially fought for and occupied Scarborough Castle on behalf of Parliament, but then switched to the Royalist side. Apart from a brief and bloodless recapture by Parliamentary forces in 1643, Cholmley successfully held Scarborough and the castle for the King, providing an invaluable port, until 1645. After a long and bloody siege, during which the castle (and St Mary’s church below) were severely damaged, Cholmley, with no food and only 25 men fit enough to fight, was forced to surrender; more than half of his original force of 500 had perished. A second – much briefer – siege took place when the latest Parliamentary commander, clearly a man of principles, also declared for the King because Parliament had failed to pay the garrison. After the Civil War, Scarborough Castle became a prison – one of its inhabitants from 1665-66 was George Fox, founder of the Society of Friends (Quakers), who complained that the conditions were appalling. However, apart from attacks by the Dutch and American navies in 1653 and 1779 respectively – obviously nothing to worry about – Scarborough’s military adventures seemed to have come to an end. 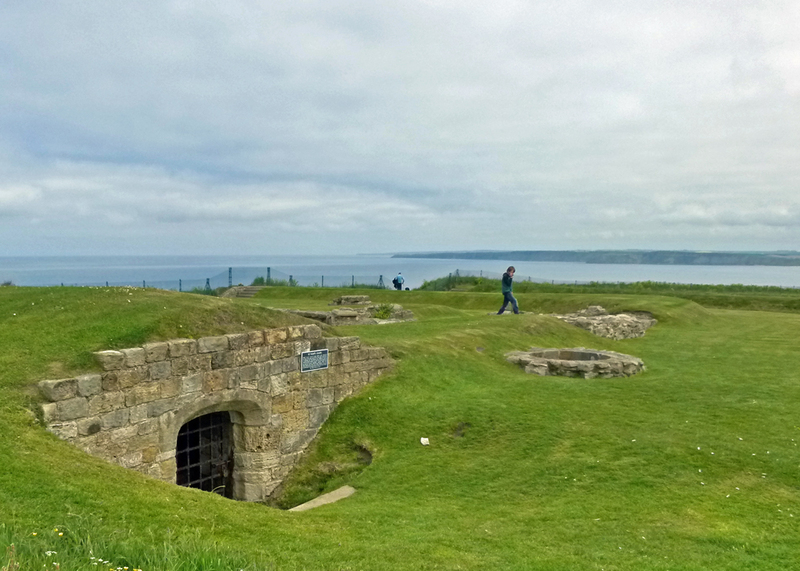 A barracks for 120 men had been built in the wake of the 1745 Jacobite rebellion (on the site of King John’s chamber) and a battery of 12 guns was established on the headland. This was reinforced during the Napoleonic Wars and some French prisoners were also briefly held captive at the castle. But, while the world got smaller around it, for the next hundred years or so all remained relatively quiet at Scarborough Castle. Peace was shattered for Scarborough at five minutes past eight in the morning of 16th December 1914. Two battle cruisers of the German Imperial Navy, Von Der Tann and Derrflinger, opened fire on the town, as well as, separately, on the towns of Hartlepool and Whitby. The attack was ostensibly an attempt to draw Britain’s Grand Fleet into battle. In a bombardment that lasted about 20 minutes, 200 shells were fired at Scarborough: the castle and its barrack block were seriously damaged, as were other buildings in the town below; 90 people were injured and 18 killed, including 14-month old John Shields Ryalls, who perished with his nurse, in her arms. Most of Scarborough Castle is now in ruins, a picturesque, haunting (or haunted), silhouette on the skyline. The castle gate and barbican, spanning the only reasonable approach to the promontory between Scarborough’s North and South Bays, is still impressive though; Henry II’s great keep, so badly damaged in the Civil War, looms over you and the curtain wall extends along the south, until it disappears over the eroding cliff. The 18th century Master Gunner’s House includes displays of interesting artefacts found on the site. Other remains – John’s chamber and hall and the Roman signal station – can be seen in outline. Don’t visit Scarborough without seeing the castle – it is a steep walk to get there, but worth the effort; the staff are friendly, it’s a bracing stroll around the top of headland, with great views on a good day and, high over the seaside town, it is a world removed from it. Though it has to be said that there is not much left to see of the castle, it is surprising any has survived, really, and hard to believe that so much happened there; yet so much we do not know. Still, with a bit of imagination, I’m sure you could conjure up a few ghosts from its 3500-year history: Iron Age Celts, Roman soldiers, Anglo-Saxon and Viking raiders, medieval knights, Cavaliers and Roundheads, Hanoverian and Victorian soldiers – the entire cast is available to you. You might want to keep a particular eye open for Piers Gaveston, though, the little tinker. Oh, the views are amazing. I’m always very impressed at how people built castles on spots where it seems already difficult to stand on your two feet! Wonderful story and the views are amazing. I don’t mind ghosts, but this one sounds like he could change my mind… yikes. 1. King Harald Hardrada set fire to the town of Scarborough in 1066 and slaughtered many of the residents. What for? Did he not know what was going to happen to his side? 2. Thomas Stafford, who incited rebellion against the Catholic Queen Mary and King Philip of Spain, knew he would die. But he may not have known that dozens of his followers would be executed as well. I enjoyed. 🙂 Cranberry Morning is in your neck of the woods as I type this. I think she was going ghost hunting with Mr. C. Just Kidding…I know she was visiting all sorts of places, she is in Blockley today. Kevin and Judy are dear friends of ours and we live about 20 miles from them. So if you visit, be sure to let us know. My boys would love to meet you, they enjoy your posts as much as I do. I used to lead walking holidays based at Scarborough and used to tell guests some of what you’ve written there. No matter how many times I said it I could never really believe that such things ever occurred in such genteel surroundings as Scarborough! Now I am all nostalgic! Scarborough was my late husband’s and my favourite place to spend our summer holidays, and visiting the castle at least once was always part of it. I loved coming up to the vast open spaces inside the castle’s walls, with the wind blowing and the gulls making their typical seaside noises. That’s a tough one…but I hope you smile when, or if, you make it back. Thanks for all the good info. and your pictures are great! Have a good week! I had no idea so much had happened here and that some of the damage was as recent as WW1! Thanks for another excellent well-illustrated post. A complex, bloody history, but a marvelous place to explore, as long as one avoids running into headless ghosts. So interesting! Love the ghost and the chip wrappers. 🙂 Excellent history and accompanying photography!